Bacteria and fungi are responsible for the decomposition of dead seagrass blades. Microfauna and meiofauna colonize the dead seagrass blades, feeding on the bacteria and fungi as well as on the dissolved organic matter released from the decomposing blades. These dissolved organics also support phytoplankton and zooplankton which in turn provide prey for organisms further up the food web. Lacking a firm substrate for attachment, seagrass beds contain benthic macroalgae attached to sediments, rocky outcroppings, and the seagrasses themselves. Calcareous algae lives among the seagrasses, producing calcium carbonate which eventually becomes incorporated into the surrounding sediments. Drift algae form large unattached masses along the sea bottom and drift about with any water movement. Red algae and brown algae are also common within seagrass habitats. In addition to calcareous algae, the majority of drifting algal masses are species of red algae. 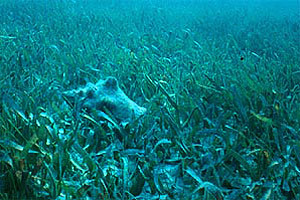 Seagrasses dramatically increase the surface area of the habitat for the attachment of epiphytes. On turtle grass (Thalassia testudinum) alone, over 100 species of epiphytic algae have been documented. Epiphytes cover seagrass blades more at the tips than toward the bases in order to receive more sunlight than those lower on the blade. 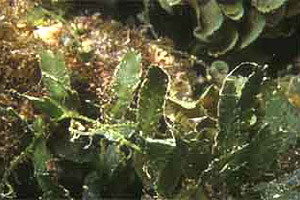 These epiphytes reduce seagrass growth due to shading. Epiphytes, along with the seagrass blades, eventually become part of the detritus. Invertebrate fauna living in seagrass habitats represents a diverse group. 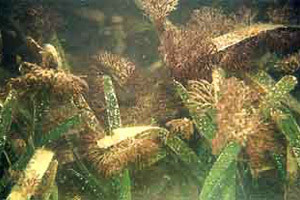 Seagrasses provide a rich source of food for invertebrates, primarily in the form of epiphytes. 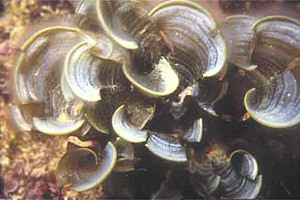 Epibenthic organisms reside on the surface of the bottom sediments. Some epibenthic invertebrates feed on both the epiphytes living on the seagrass blades as well as the blades themselves, such as the queen conch (Strombus gigas). 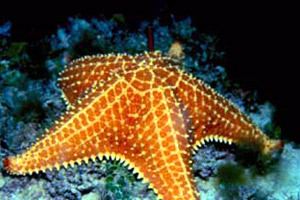 Other epibenthic species, including the Bahamian starfish (Oreaster reticulatus) and various gastropods, feed on infaunal organisms found living within the sediments. Feeding on detritus, epiphytes, and seagrass blades are various sea urchins that move from nearby reefs to feed in the seagrasses at night. Another echinoderm, the sea cucumber (Holothuria floridana), moves slowly along the surface of the sediments ingesting sand grains and algae. 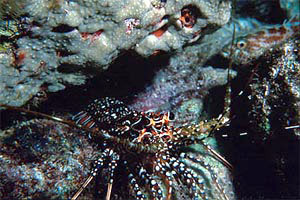 Pink shrimp (Paneaus duorarum) and juvenile spiny lobsters (Panulirus argus) find refuge among the blades of seagrasses. Epiphytic organisms, dominated by gastropods, are common throughout turtle and shoal grass habitats. 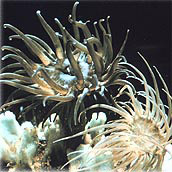 These include anemones, bryozoans, and sponges, suspension feeders that live attached to the blades of seagrass. Without the dramatic increase in surface area provided by the seagrasses, the diversity of epiphytic organisms would be much lower. 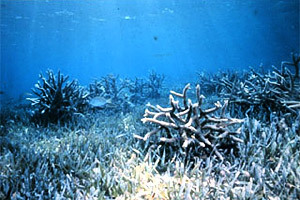 Throughout shallow turtle grass communities, small patches of stony corals are common. As water depth increases, sponges become more common and may be found growing among the seagrasses or attached to dead coral skeletons. Although not obvious, infauna communities thrive within the sediments of seagrass beds. 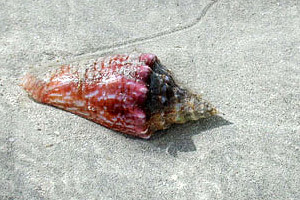 The rigid pen shell (Atrina rigida), along with many other bivalve molluscs, is a common filter feeder found within the sediments of many seagrass beds. Seagrass beds provide nursery areas and feeding grounds for many species of fish, including those of commercial and sportfishing value. 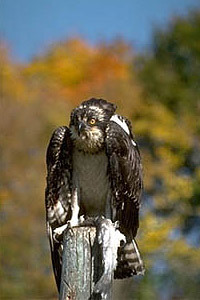 These habitats are also the home to many resident species. 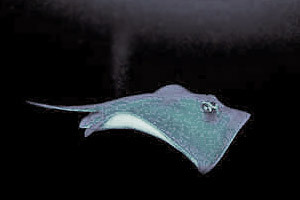 Year-round residents are typically small in size and cryptic. The emerald clingfish (Acyrtops beryllina) is a tiny epiphytic fish only found associated with turtle grass. Common year-round resident fish of south Florida seagrass habitats include the pipefishes (Syngnatus spp. 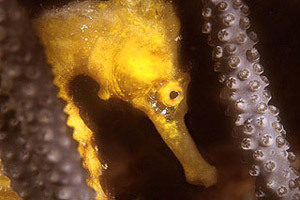 ), seahorses (Hippocampus spp. 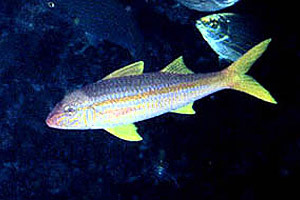 ), and the inshore lizardfish (Synodus foetens). Parrotfish (Sparisoma spp.) reside in the clear waters of the Florida Keys, feeding directly on blades of seagrass. Sharptail eels (Myrichthys breviceps) and young moray eels (Gymnothorax spp.) forage in seagrass beds for mollusks and other prey. Seasonal residents are fishes that spend part of their life cycle in seagrass beds, mainly as a nursery area for spawning and/or juvenile development. The spotted seatrout (Cynoscion nebulosus) and silver perch (Bairdiella chrysura) are among seasonal residents that are common as juveniles in seagrasses. 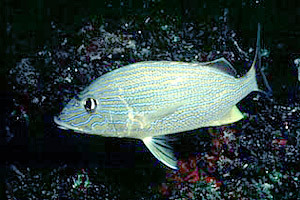 Other seasonal species include pigfish (Orthopristis chrysoptera), blue-striped grunt (Haemulon sciurus), French grunt (H. flavolineatum), ceasar grunt (H. carbonarium) and the tomtate (H. aurolineatum). 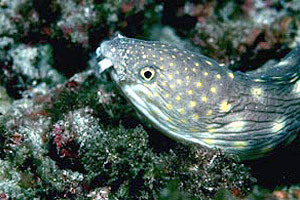 Coral reef fishes often utilize seagrasses as nurseries. 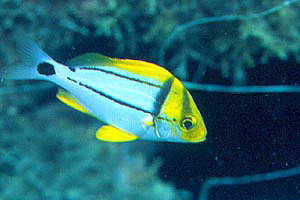 Juveniles of the ocean surgeonfish (Acanthurus bahianus) and the doctorfish (A. chirurgus) are commonly observed residing among seagrasses. The spotted goatfish (Pseudupeneus maculatus), yellow goatfish (Mulloidicthys martinicus), gag grouper (Mycteroperca microlepis), gray snapper (Lutjanus griseus), spotted seatrout (Cynoscion nebulosus), and southern flounder (Paralichthys lethostigma) also occur as juveniles in seagrass habitats. The bucktooth parrotfish (Sparisoma radians), redtail parrotfish (S. chrysopterum) and the emerald parrotfish (Nicholsina usta) all reside in seagrass beds as juveniles as well as immature adults. 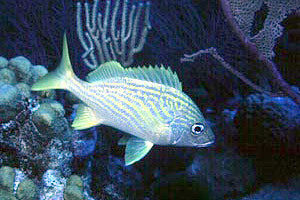 A commercially valuable group of fishes, the snappers, are common throughout south Florida’s seagrass habitats. These include the gray snapper (Lutjanus griseus), lane snapper (L. synagris), schoolmaster (L. apodus), mutton snapper (L. analis), dog snapper (L. jocu), and yellowtail snapper (Lutjanus chrysurus). 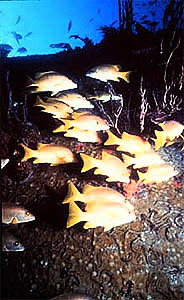 White grunts (Haemulon plumieri) are abundant in the turtle grass beds of south Florida, while other grunts such as the porkfish (Anisotremus virginicus) rarely occur in these habitats. 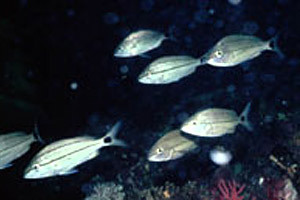 Other species of grunts are present as juveniles in these waters. 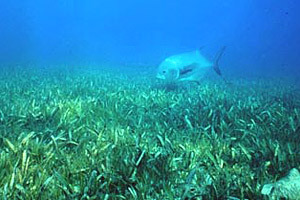 Seagrass beds of south Florida include large numbers of reef fishes when the beds are adjacent to coral reefs. 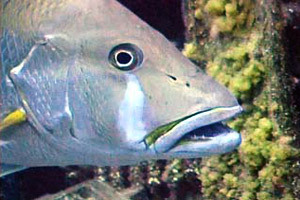 Fishes find shelter on the reef during the day, moving to seagrass beds at night to forage. 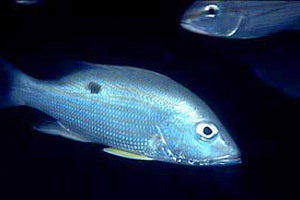 Grunts and gray snappers (Lutjanus griseus) live diurnally on the reefs and feed nocturnally over seagrasses. 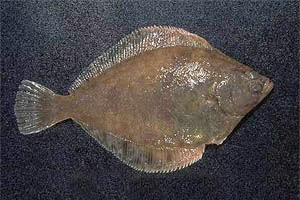 Other nocturnal visitors include hardhead catfish (Arius felis), fantail mullet (Mugil gyrans), Atlantic thread herring (Opisthonema oglinum), scaled sardine (Harengula jaguana), silver perch (Bairdiella chrysura), and ladyfish (Elops saurus). On the other hand, species occurring over seagrasses only during the day include jenny mojarra (Eucinostomus gula), pinfish (Lagodon rhomboides), and flathead mullet (Mugil cephalus). 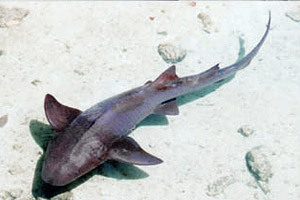 Offshore migrants such as nurse sharks (Ginglymostoma cirratum), smalltooth sawfishes (Pristis pectinata), southern stingrays (Dasyatis americana), and Atlantic stingrays (Dasyatis sabina) visit seagrass habitats in search of prey. Several species of sea turtles reside in the waters of the Gulf of Mexico and Caribbean, including the green sea turtle (Chelonia mydas). 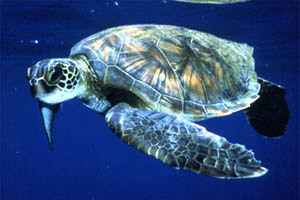 The main food of this sea turtle is Thalassia testudinum, commonly referred to as turtle grass. 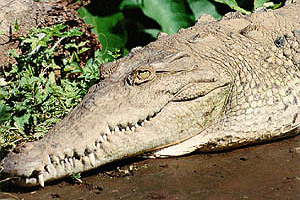 The American crocodile (Crocodylus acutus) occurs in the shallow waters of Florida Bay and the northern Florida Keys. Although it is unknown to what extent the crocodile utilizes seagrasses, they are known to feed in these areas. 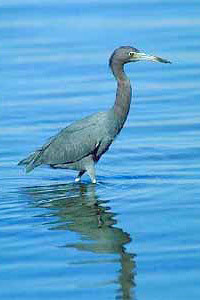 Large numbers of birds utilize seagrass beds, especially wading birds searching for food. 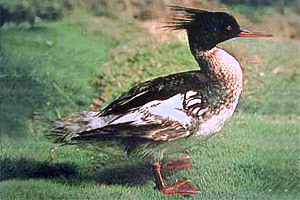 The three common feeding modes of birds are waders, swimmers, and plungers. 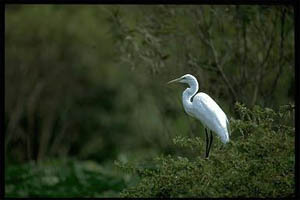 The great egret (Casmeroidus albus), reddish egret (Egretta rufescens), and little blue heron (Egretta caerulae) are among the wading birds that frequent seagrass beds in search of food. 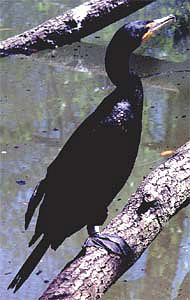 Double-crested cormorants (Phalacrocorax auritus) pursue fishes throughout the water column. 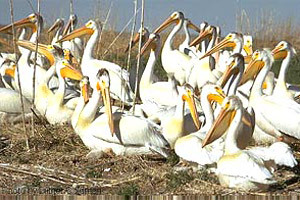 Other swimming birds include the white pelican (Pelecanus erythrorhynchos) and red-breasted merganser (Mergus serrator). Brown pelicans (Pelecanus occidentalis) fly over seagrass beds in search of prey. 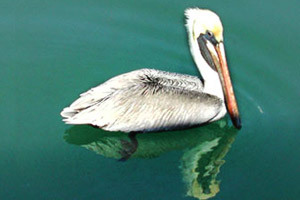 Once a fish is spotted, the pelican plunges into the water using its pouch-like bill to scoop its prey. Ospreys (Pandion haliaetus) and southern bald eagles (Haliaeetus leucocephalus leucocephalus) seize prey from the water surface with their talons. 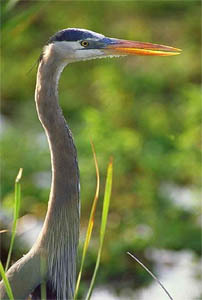 Seagrasses also provide excellent foraging for large wading birds such as herons. Manatees (Trichechus manatus) and bottlenose dolphins (Tursiops truncatus) feed within the waters over seagrass habitats of Florida. 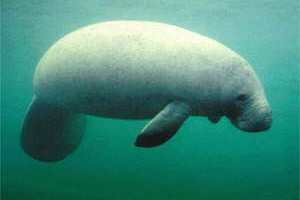 Manatees are primarily tropical in distribution, however in Florida waters, manatees are found in shallow seagrass meadows or in spring-fed warm water rivers during the cool winter months. 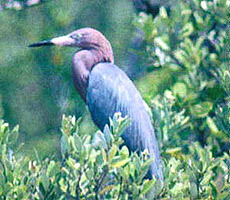 They feed on aquatic vegetation including seagrasses. 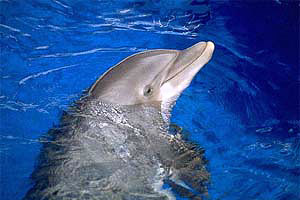 The bottlenose dolphin (Tursiops truncatus) is the most common marine mammal in this region, feeding over seagrass beds, even in waters less than 3 feet (1 m) in depth. 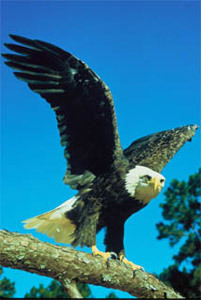 They feed primarily on large fish, squid, and invertebrates. decomposition: breakdown of matter by bacteria and fungi, changing the chemical makeup and physical appearance of materials. microfauna: animals too small to see with the naked eye, generally less than .1mm long, includes protozoa and nematodes. meiofauna: small animals (between .1mm and 1mm) that live in the sediment at the bottom of a body of water. phytoplankton: microscopic plants that depend upon water currents for transportation, primary producers in aquatic environments. zooplankton: animal portion of the plankton, composed primarily of protozoans, small crustaceans, and larval fishes. substrate: the material upon or within an organism lives or grows, including soil, plants, animals and rocks. benthic: pertaining to organisms that live on rock or sediment beneath a body of water. epibenthic: organisms that live on the surface of a substrate, including motile organisms such as fish, gastropods, echinoderms, and a variety of crustacea. calcareous: containing characteristics of calcium carbonate, calcium, or limestone. calcium carbonate: compound consisting of calcium and carbonate with a chemical structure of CaCO3. epiphytic: any organisms that grow on the blades of seagrasses, including algae, diatoms, and other encrusting organisms. detritus: Dead or decaying organic matter. echinoderm: radially symmetrical animals that are exclusively marine and possess a spiny skin and a system of water-filled canals that aids in feeding and locomotion (e.g., sea urchins, sand dollars, and sea cucumbers). algae: a diverse group of photosynthetic organisms that lack roots, stems, leaves, and vascular tissues. diversity: refers to the variety of species within a given association, areas of high diversity are characterized by a great variety of species. infauna: organisms that live buried in sediments, including a variety of polychaetes, burrowing crustaceans, and molluscs. cryptic: camouflage or coloration serving to hide an animal or plant. tropical: tropical zone lies between 23.5 degrees north and south of the equator, has small seasonal changes in temperature and large seasonal changes in precipitation.